Seeing is believing: what does your DNA look like in 3D? The team on Day Two at New Scientist Live: (L-R) Nicki Gray, Veronica Buckle, Marieke Oudelaar and Martin Larke. Clue: it’s a bit more complicated than a bendy ladder. Over the past year, scientists working in the Computational Biology Research Group and the MRC Molecular Haematology Unit at the MRC WIMM have been collaborating with Goldsmiths University in London to produce CSynth: new interactive software which allows users to visualize DNA structures in three dimensions. The team took the technology to New Scientist Live in September this year, and wowed hundreds of people with this incredible new tool. In this blog post, Bryony Graham describes the science behind the technology, and how the team managed to explain some pretty complex genomics to thousands of people using some pieces of string, a few fluffy blood cells and a couple of touchscreens, all whilst working under a giant inflatable E. coli suspended from the ceiling. Of course. Over the past decade, technologies that allow scientists to read the DNA code have improved exponentially, allowing researchers to generate huge amounts of data about the genetic makeup of thousands of people. But being able to read the code is one thing; understanding what it actually does is quite another. One aspect of working out precisely what your DNA does and how it works relates to the 3D shape the DNA molecule itself forms when inside your cells. To be specific, there is approximately two metres of DNA squished into every single cell in your body – but it’s not just randomly shoved in there in any way it’ll fit. The DNA is carefully folded so that it can be meticulously packaged inside each cell – and we now know that the way in which it’s folded influences how the DNA is read, and therefore how your body functions. Until recently, however, scientists have only had very limited ways of trying to work out what this structure might actually look like. Several similar techniques have been developed in recent years, including one by Jim Hughes here at the MRC WIMM called Capture-C, which allow scientists to identify which pieces of DNA are likely to be in physical proximity inside the cell – but these methods can’t predict what the three dimensional structure might look like between those pieces of DNA that are next to each other. Does it loop out? Fold backwards? Twist around? To try and address this, Jim Hughes (MRC Molecular Haematology Unit) and Steve Taylor (Computational Biology Research Group) teamed up with software designers at Goldsmiths University who are more often found designing high-spec computer game graphics than fiddling around with the genetic code. The team at Goldsmiths are part of the Department of Computing, and includes Stephen Todd, Peter Todd, William Latham and Frederic Fol Leymarie. Together, they developed CSynth: software which allows users to visualize how a specific piece of DNA folds in a particular cell type. By combining this software with high resolution microscopy, in a project led by Veronica Buckle, the team hope for the first time to try and work out what the physical structure of a specific piece of DNA looks like inside a cell. 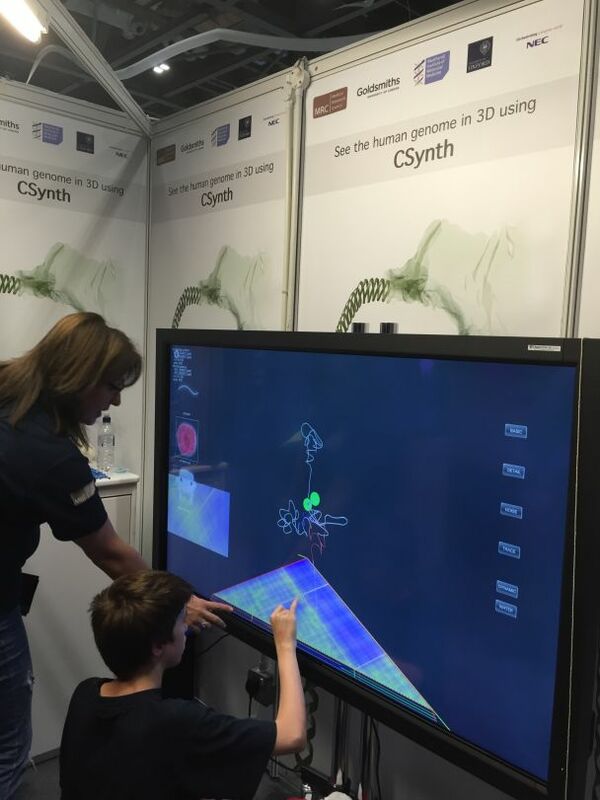 This is all pretty complex stuff: but the concept is so fundamentally important to the entire workings of the human body that the team decided to take CSynth to New Scientist Live, a four-day festival of ideas and discovery at the ExCeL in London. They wanted to explain to non-specialists just why they’d developed the software in the first place, and why understanding such fundamental principles is so critical. Over 22,000 tickets were sold in total for the event – and on Saturday alone, the team of five spoke to almost a thousand people. The team found that no matter how old their audience were, almost every conversation they had was incredibly in depth and interesting; in fact, they felt as though some of the questions they were asked even meant they looked at the research differently themselves. Since the event, members of the team have received emails from students interested in knowing more; specialists in other fields looking for collaborations; and others so impressed by the work they wanted to distribute flyers and leaflets about the software in their local communities. Taking four days out of busy schedules is an enormous ask for anyone, but everyone from the MRC WIMM who took part in the event said that they enjoyed the experience, and felt like it highlighted to them the value of the work they are doing – which is sometimes so easy to forget. Nicki Gray inspiring the next generation. Therapeutic antibodies can be isolated from healthy volunteers exposed to the Ebola vaccine, but not Ebola virus itself. In our second interview based in the MRC WIMM’s ‘An evening with’ events, we spoke to Professor Angela Vincent, Emeritus Professor of Neuroimmunology at the Nuffield Department of Clinical Neurosciences. Angela kindly spoke to us about her research on antibodies and their role in neuromuscular diseases, and shared her thoughts with the next generation of scientists. Student Matt Dickinson discusses how he took the unusual decision to do a PhD in medical research following a degree (and practice) in veterinary medicine- and discusses the unexpected benefits of career changes. The MRC WIMM editorial team is here to help. Check who we are and how you can contact us.